So. 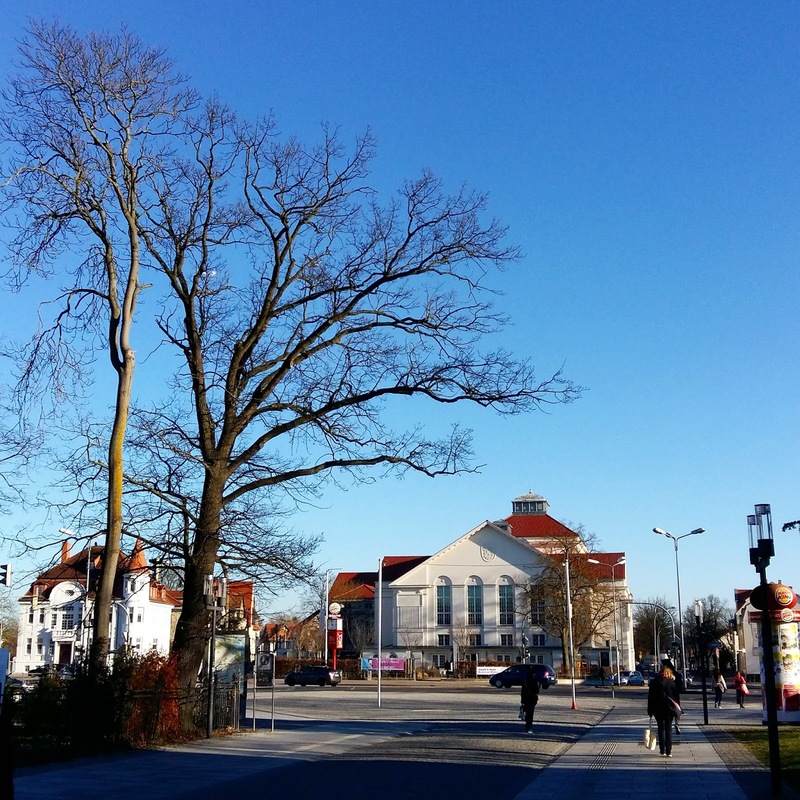 Friends and long-time followers will remember the previous chapters of The Greifswald Story. Me and my friends Rami and Ida traveling from Finland to Greifswald, Germany, to see Chris Murray perform the titular roles of Jekyll & Hyde the musical, only to find out the show had been cancelled. The disappointment. The disbelief. The invitation from the theatre to come back. First, we scoffed. Then, we considered. Two weeks ago, we traveled to Greifswald to try again. If our last journey was Murphy's Law the Musical all the way through, with melting asphalt and locks that wouldn't open, this was the complete opposite of that. Everything that could go right, did. Planes, buses and trains were on time, the weather was beautiful and good time was had by everybody involved. Theater Vorpommern took great care of us. They had reserved a single room and a two-room suite in a nice hotel in the middle of town for the three of us, complete with fortune cookies on our pillows waiting for us. In the evening, we were escorted to the theatre by a lovely member of Theater Vorpommern's personnel and greeted by some of the staff, and got to choose our seats, with good seats reserved for us both in the stalls and in the dress circle (we chose the stalls). Before the show, we were told there had been some trouble: both female leads had fallen ill, and finding a replacement for Lucy had proven a bit difficult – but after spending hours making calls all over the German-speaking part of Europe, they found an emergency cover. So we dodged that bullet! After the summer adventure, it feels almost unbelievable we were so lucky this time. And before we knew it, lights went down and the show began. This is not going to be a traditional review, since I don't remember (nor, to be honest, feel like analysing) too many details from the performance. After being awake for almost 20 hours and traveling a thousand kilometers, it all just felt like a happy, welcoming, familiar-yet-unknown blur to me. I haven't felt as involved in a fictional world in ages. At times, it felt like I was watching the show for the first time (and, when it came to certain scenes, namely Lucy's death, it really was the first time I've ever seen such an interpretation). The ensemble. Photo by Vincent Leifer. Chris Murray's This Is the Moment. I don't much like the song and tend to find it both overdone and overblown. But when you have the right person singing it... I don't think I've ever enjoyed hearing this song this much. Ulrike Barz as Lucy. You would never ever have guessed she's an emergency cover, she's a diamond. From the get-go, this Lucy knew what she was getting into and who Jekyll and Hyde truely are. She enjoyed Hyde's company more clearly than any Lucy I've seen before, giving the relationship a fresh spin. 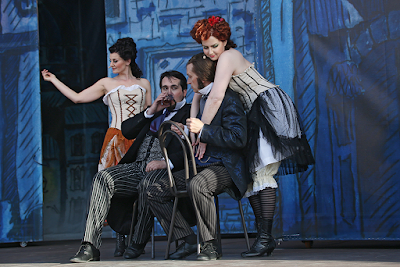 Thomas Rettensteiner as Utterson. I've been blessed: every Utterson (my number one favourite character in this musical) I've seen live so far has been truely precious, and Rettensteiner's is no exception. A proper mix of Jekyll's anger management coach, a good friend, a true Victorian gentleman with all his hypocrisies, and an operatic baritone. I'm a fan. The Quentin Blake-esque hand-drawn illustrations of Christopher Melching's sets, featuring a laboratory and London streets. It's a fun look that made me long for an edition of Stevenson's original novel illustrated by Blake! Utterson and Jekyll in The Red Rat. Photo by Vincent Leifer. Overall, I'd describe the production as energetic, gleeful, eccentric and, between the lines, surprisingly thought-provoking. You'd think after over three years as a passionate Jekyll & Hyde fan, I would know these characters. But no! It's so much fun when a production makes you see a familiar story from a new point of view. It was also a weird performance in many ways, with odd characterisations and production decisions and a mood way more cheerful, silly and over-the-top than I expected. I didn't agree with every decision they made, but I'm not complaining. Quite the contrary: after an adventure such as ours, if the production had been any less out-of-the-ordinary, it would have been a disappointment. The fun didn't end when the performance did. The theatre offered us wine, canapés and the chance to chat with Chris Murray about the show. From a fan's perspective, there's nothing better than seeing a show and then hearing the star's thoughts about their character right afterwards. Good times, really good times. The next day, our way home was blissfully uneventful. Gazing out of train windows, looking at birds and deer and graffiti on old station buildings, discussing last night's show. Chill and relaxing. This whole adventure begun with a half-joking promise that if Chris Murray ever plays the role of Jekyll/Hyde again, we'll be there to witness it. In the airport on our way home, I and Rami already agreed upon the conditions of our next trip to Germany. When X happens, we'll pack our bags again. To be on the safe side, we won't reveal what X stands for, not just yet. But maybe we will, in due time, in a form of another travel journal. Greifswald, Theater Vorpommern, Thalia herself: THANK YOU. Jekyll & Hyde photos by Vincent Leifer / Theater Vorpommern. Selfie gif by Rami!